Lime Green ~~ I love this color! These will quickly become your go-to set! Lime Turquoise Magnesite Teardrops are wire wrapped in hand antiqued copper wire and hang a total of 1.75 inches from the top (on the copper french hook wires). These stones have natural striations and markings and will vary from stone to stone. Your pair will be very similar to the ones shown above, with slightly different striations. Each piece is handmade to order, and due to the free form nature of wire wrapping, no two pairs will ever be the same. 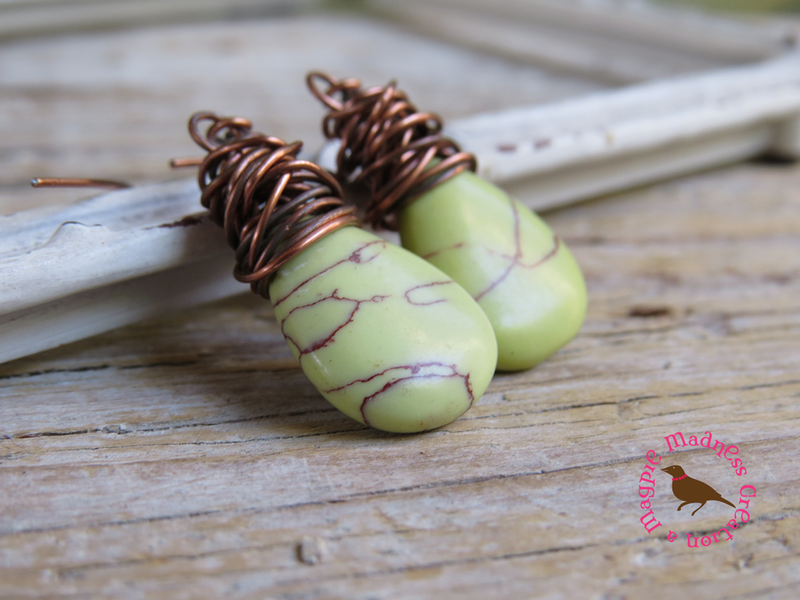 Earring kidney wires are made from antiqued copper and are nickel and lead free. I wear mine more often than I should:)! 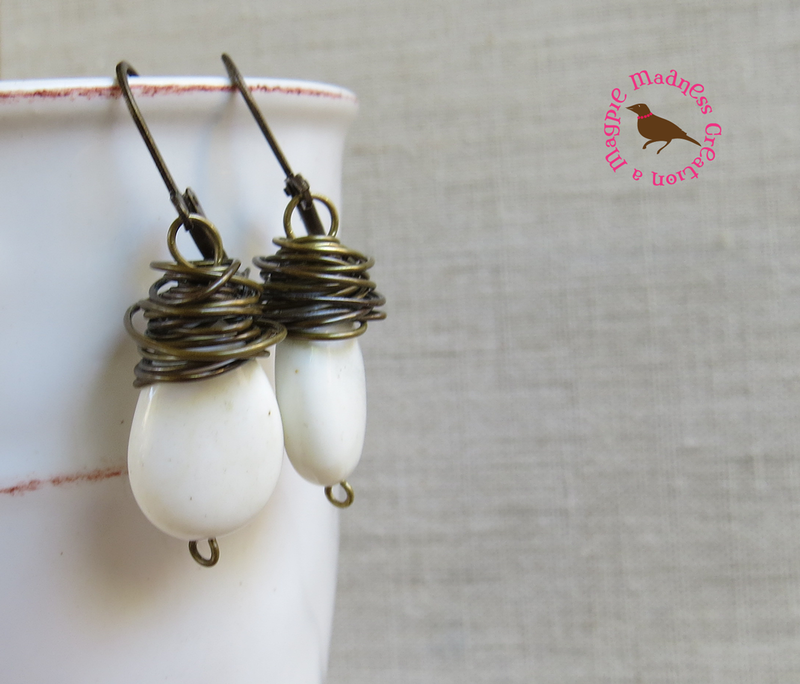 These teardrops make a terrific gift! The wire is hand antiqued solid copper wire. See earrings here. 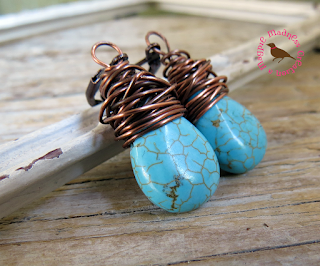 Blue Turquoise ~~ I pop them in for every day, going out and to dress up my jeans. I have a set that I wear three days out of seven (I know that's bad considering I have access to hundreds of pairs). 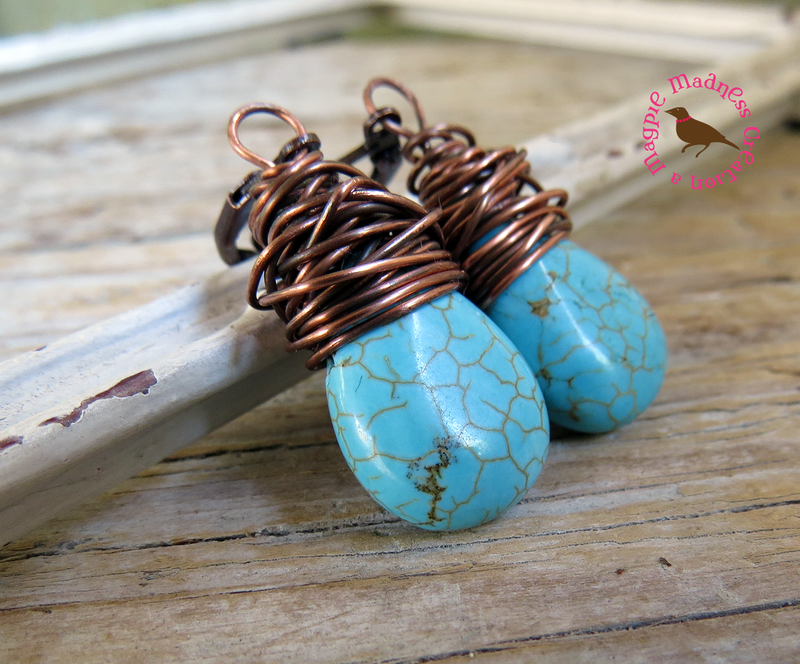 Turquoise Magnesite Teardrops are wire wrapped in hand antiqued copper wire and hang a total of 2.25 inches from the top (on the 1.25" kidney wires). Turquoise has natural striations and markings and will vary from stone to stone. Your pair will be very similar to the ones shown above, with slightly different striations. 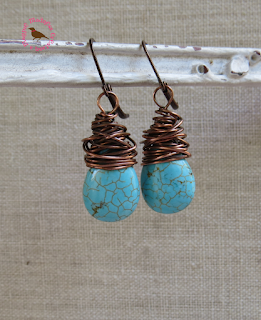 Each piece is handmade to order, and due to the free form nature of wire wrapping, no two pairs will ever be the same. Earring kidney wires are made from antiqued copper and are nickel and lead free. I wear mine more often than I should:)! 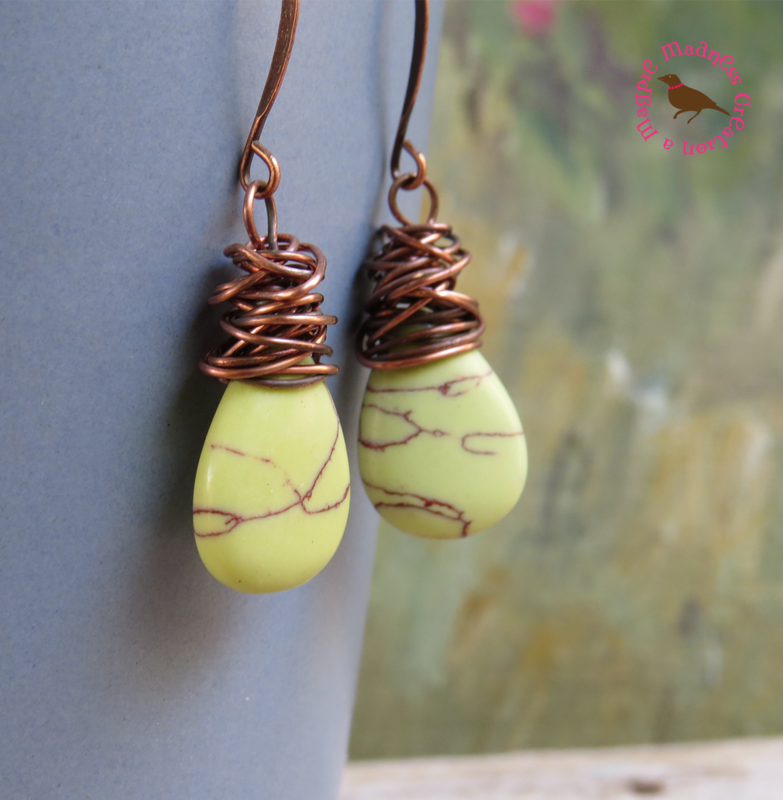 These teardrops make a terrific gift! See blue teardrop earrings here. White Turquoise Teardrop Earrings ~~ Simple white turquoise teardrop dangle earrings. 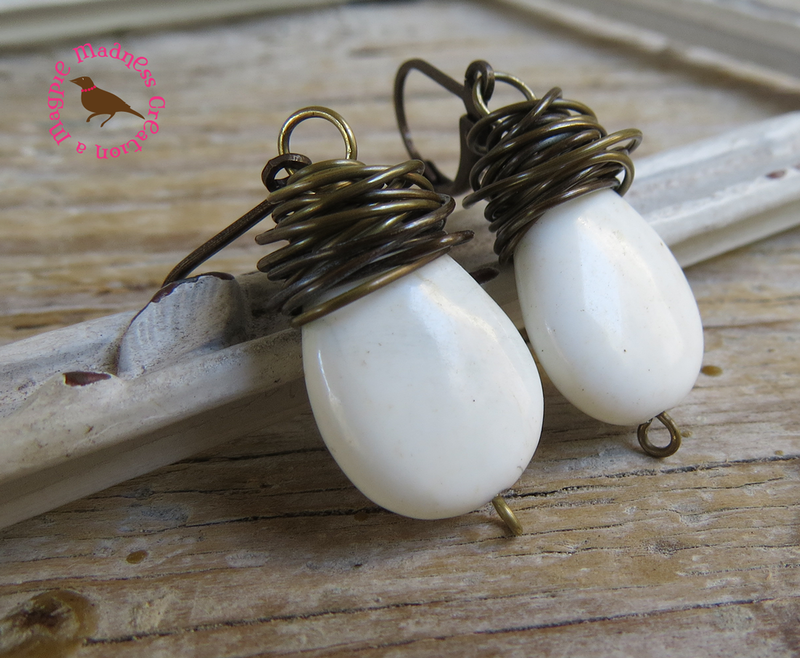 I wired these teardrops in hand antiqued brass wire and hung from solid brass antiqued wires. Choose your style!! Choose your favorite ear wire style at checkout from a range of styles. I've shown the leverback wire style in these pictures. Earwires are solid brass. See here.